A local Lebanese official says gunmen from the militant Shiite group Hezbollah and Shiite residents have tightened their chokehold on a Sunni town near the Syrian border. The standoff around the eastern Lebanese town of Arsal is the latest in an ever-growing spillover of the Syrian conflict into its smaller neighbor. Ahmad Fliti, the deputy mayor of Arsal, says Shiite gunmen set up roadblocks and closed off the road connecting the town to the rest of Lebanon, angry over recent rocket attacks and a car bombing by blamed on Sunni militants. Fliti says the gunmen on Tuesday opened fire on cars from Arsal that tried to approach the roadblock. He says concerns are rising that aid won’t be able to reach thousands of Syrian refugees sheltered in Arsal. Future Movement bloc MP Assem Araji warned Hezbollah of waging an attack against the town of Arsal. “Any sectarian adventure [attack] against Arsal, whether [waged] by Hezbollah or any other party, will definitely lead to a civil war,” Araji told Kuwaiti newspaper As-Seyassah in remarks published Tuesday. Araji also said that no rebels from the Free Syrian Army had entered Arsal. “If there were gunmen who fled to Lebanon from Syria, then they would still be in bordering towns but none have entered Arsal at all,” Araji said. 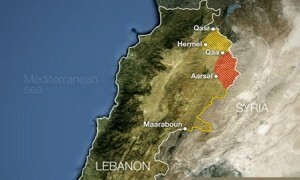 Hezbollah militancy will backfire on them in Lebanon if they start against Lebanese Sunnis. They will no longer be the weapons only party since everyone else has a right to defend themselves too against any occupation whether from Israel, Syria, Iran, Hezbollah, etc. I’m pretty sure they’re not the “weapons only party”. What do you think they fight with in Tripoli? Good point, the idea of a resistance gives credence to any armed group that organized for whatever interest the may have. No one should be surprised if the Sunnis start up their militia in the coming months. I am actually surprised that they do not have one already. I said it before and I say it again, either all militias arm up and keep this country as a brothel or disarm all and assist in rebuilding our army. This resistance thing or state within a state thing is not going to work. Calm down ya shabeb, the army will take care of… watching. Brave Resistance besieging a Lebanese town. Let’s hear Puppetttttt’s version of the event. Maybe they’re surrounding Arsal to tell the people there that they respect their political views, but will shoot them if they dare leaving the town. Where is the army in Arsal and on the border and what are they doing ? The army should have been at the border inspecting everyone who is fleeing the Syrian conflict in Yabroud. I don’t think HA wants to attack Arsal, not that I am defending HA. I think they are afraid of the alleged suicide bombers who came from Syria and preparing themselves in Arsal, and for this reason they surrounded the town. In any case, this security measure is not HA’s duty/function, it is the Lebanese Army’s duty. Yeah I understand it is the lebanese army to defend the lebanese border. But the mess came from hizbulah. They engaged in the barbaric war in Syria and when they got attacked , they need the lebanese army to defend them. Or let me say it this way to defend iranian tugs living in lebanon. Assume they are still fighting in Tripoli. No electricity, so No words from friends who’s cell phone batteries go – or the nets are cut …. no news on it even in Daily Star. Phoning produces ‘Busy’. I’m sure the doctors are …. Welcome to syria, who is lebanese and who is syrian is not known anymore.